Get a great pay monthly deal on the Smarty Network, all the latest handsets at low prices. Want fantastic and fast mobile service without needing to sign a contract? Then check out TigerMobiles.com selection of deals from Smarty. A simple, no-nonsense set of plans that all contain unlimited texting and calling, Smarty is a great choice if you're looking for cheap service with no commitment. You'll get a choice of mobile data tariffs and you can even rollover that data to the next month! To get started just use our comparison tool below to find the best deal for you from Smarty. Smarty is one of the newest operators on the UK market and is a sub-brand of nationally known operator Three. Designed to give simple service options at great prices, Smarty offers no-contract plans that are cheap and easy to understand. Plus, unlike with many other operators, you can roll over any unused data to the next month. Since Smarty is owned by Three it should be no surprise that they use Three's infrastructure to provide service. Three has excellent coverage across the UK, particularly when it comes to 3G, and their 4G service is growing rapidly as well. And with Smarty, you get the same great coverage and fast internet speeds along with plans that aren't going to break the bank. Choosing a plan with Smarty is easy. All their plans have unlimited calling and texting, you just need to choose which of the three offered mobile data limits you'd like. And there's no contract to sign either. All plans with Smarty are 30-day rolling plans, meaning you can cancel anytime, or just let that plan roll over to the next month, no hassle. Smarty is a service only operator, so they don't currently offer incentive phone deals. However, if you already have a phone or you prefer to buy your own, then this lets you keep costs down and still get the service you need. Of course, Smarty has special deals too. The best of these is the ability to roll over unused data to the next month's plan. Don't use up your data limit? No problem, it'll just be added on to next month! Smarty offers easy to understand plans with no hassle and no complications. There are no contracts to sign, and all you need to do is choose your data limit. Plus, you get to roll over all that unused data to the next month too! Think that this could be the perfect operator for you? Then just check out our comparison tool for the best deals from Smarty. 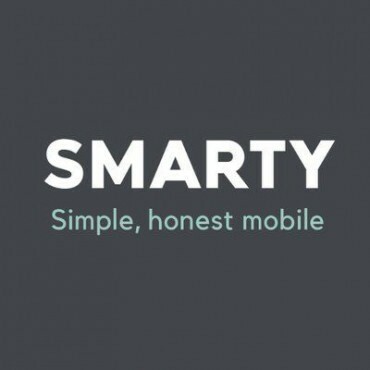 Smarty is a newcomer to the UK mobile market, having launched in September 2017. The company is a low-cost off-shoot of mobile giant Three, and specializes in cheap, easy to understand services. Smarty is an MNVO and uses Three’s infrastructure to provide service. Do note that Smarty does NOT currently offer PAYG plans. Smarty is a low cost provider and offers very easy to understand plans. As such, they don’t particularly offer any benefits. They do, however, give you discounts for unused data (more info on that below). One big advantage to using Smarty is that their deals are so simple. You won’t be overwhelmed by choice here, but you’ll know exactly what you’re getting. Because all of Smarty’s plans offer unlimited texts and calling minutes there are no out of bundle charges for those. Smarty does not allow you to use more than your data limit, so there’s also no out of bundle data charges. If you need more data you’ll have to buy an add-on of 1 GB of data for £1.25. Do note that certain calls are not included in the unlimited calling minutes. International calls will be charged at between 3p and £2 per minute depending on the destination, and calls to special rate numbers will be 3p per minute plus the charge of the special rate number you’re calling. Unfortunately, Smarty does not currently offer PAYG services. Smarty has an innovative way of dealing with unused data. They do not offer data rollover (the ability to use unused data in next month’s plan), instead, they give you discounts on your next month’s bill for any unused data from this month. You will be discounted £1.25 per 1 GB of unused data (and they do calculate the discount per MB, so even if you have less than 1 GB remaining you will receive a discount on next month’s bill). If you’re unsure of how much data you need, you may as well get the largest plan available, since unused data will result in a discount and you won’t be forced to pay for an extra GB of data as you would be on a plan that’s too small. Because Smarty offers service through Three’s infrastructure coverage for the network is the same as it is with Three. Three currently offers 97% coverage across the UK for both 3G and 4G service. Three does NOT, however, support a 2G network. This is only a concern if you have an old dumb phone that can only access a 2G signal. Before signing up it’s always a good idea to check coverage in your local area using either Smarty’s online coverage checker (found on their website), or the OFCOM UK mobile coverage app, just to be sure that you’re going to have good reception. Mobile tethering is a way of using mobile data on your phone plan to access the internet on other devices (tablets and laptops) using your phone as a hotspot. Smarty does not place any restrictions on mobile tethering at all, and you are free to use your monthly data limit as you like. Just exercise a little caution, since tethering does tend to use up data limits quite quickly.